A move to welterweight and a last-minute opponent switch didn’t change the outcome for Donald "Cowboy" Cerrone, who put away Alex Oliveira with an impressive first-round triangle choke in the UFC Fight Night main event from Pittsburgh on Sunday night. Cerrone is well known as a slow starter, which has come back to bite him in several of his performances, including his last match, a first-round TKO to Rafael dos Anjos in a lightweight title fight last December. To prevent those mistakes Sunday, Cerrone said after the fight that he came to the arena with his coaches much earlier than usual to make sure he was warmed up and knew exactly what to do when the action started. "We got here at 1 o’clock today and went through the walk about 10 times, that’s the best I’ve ever felt in here," Cerrone said. The preparation certainly paid off as Cerrone not only looked comfortable on his feet in the early going but also quickly transitioned to a takedown to put Oliveira on his back, which undoubtedly surprised the Brazilian at that moment. Cerrone stayed patient as he advanced position into half guard before sweeping his leg over into mount and immediately transitioning to a triangle choke, which has been his favorite submission over the years. Before Oliveira even had time to react, Cerrone rolled from mounted triangle to his back while fluidly locking up the choke and pulling down on the head to get the submission from the bottom. Oliveira tapped almost immediately although referee Mario Yamasaki didn’t react and it actually took Cerrone pointing to the Brazilian’s hand rapping his chest for the fight to finally come to an end. The stoppage came at 2:33 in the first round. While his last fight certainly stung considering it was his first chance to bring home UFC gold, Cerrone sounded happy and content with his victory on Sunday night to get back on track while picking up his first win at welterweight inside the Octagon. Cerrone bumped up to 170 pounds following the loss to dos Anjos in just 66 seconds. 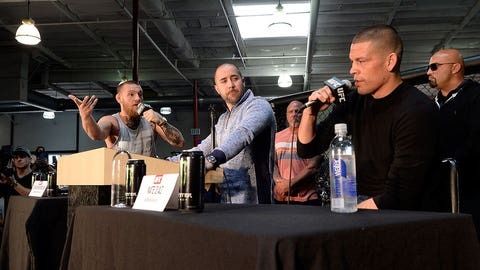 The loss set Cerrone back after he racked up eight wins in a row, but never one to be deterred, he quickly asked the UFC to put him back in the Octagon and two months later he was already headlining a show. Cerrone paid homage to Oliveira for stepping up to take the fight after his original opponent Tim Means was forced off the card following a potential anti-doping violation from a drug test that was flagged before the bout took place. “My hat is off to this dude, he took a fight on short notice against me and that’s really cool," Cerrone said. The fight on Sunday night also accounted for Cerrone’s 30th bout in the UFC in just five years. Now that he’s able to compete at lightweight or welterweight, it looks like he’s ready to add to his resume as soon as the matchmakers can find him another opponent. "I’m going to do 155 pounds and 170 pounds," Cerrone said following the win. "So if you want to get hurt, I know a guy." Considering Cerrone’s willingness to fight anyone at any time, chances are he won’t have to wait too long for UFC matchmakers to find him an opponent for one of the numerous coming up over the next few months.